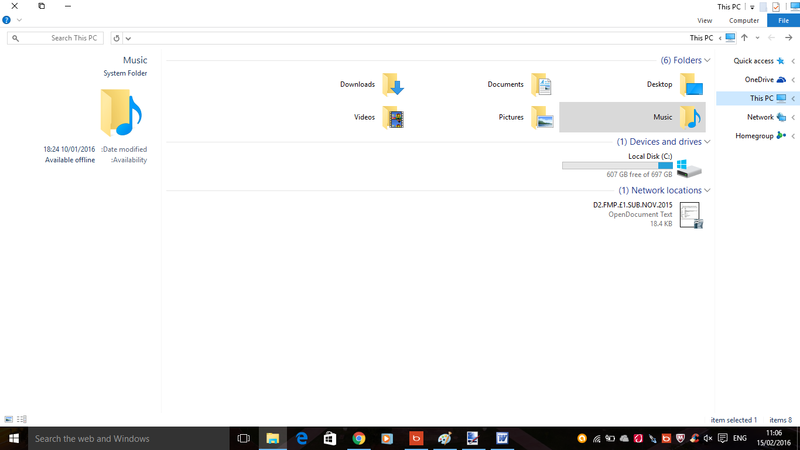 My laptop was doing a scan but when I then went on file explorer the settings had changed. The menu for my folders/pc etc is now on the right and the exit/minimize/maximize buttons are now on the top left and not the top right. I've tried googling for answers but found nothing so far that will enable me to change it back to the way it was - which was the menu being on the left and the exit/minimize buttons etc top right. Sounds like your shell32.dll got corrupted, used to be quite common for this file to go wrong on earlier versions of windows, first time I have heard of it in Windows 10. You can edit all theses settings using "resource hacker" but I don't particularly recommend it, its pretty risky if you don't get it exactly right. Mark may know how you can obtain a default shell32.dll, I usually re-install Windows from scratch when things like this happen, you don't know what else has been messed up. Thanks very much diggingdeeper, that's good advice. I just didn't want to start doing anything to the settings etc and then get into more problems! Have you ran a anti virus scan? Its weid, which makes me think you have been victim to a infected file. Have you tried a system restore? The file system32.dll when it went corrupt i would copy the file from a similar operating system. Have you launched in safe mode yet and tested to see if the problem is the same. Im not in front of windows 10 right now, but check any accessibility settings there could be a flip setting im not aware of. Hi, thanks for your reply. My laptop was doing an antivirus scan and then the settings went wrong. I have tried system restore but the menu is still on the right side. How do I copy the file system32.dll? I have another laptop running windows 10 ( that one is working fine). I will have another look for a flip setting as well. Thanks very much for your help, much appreciated. I have now tried safe mode but the menu is still on the right and the exit/minimize etc buttons at the top left. The antivirus scan didn't pick up anything either. The. dll file is more trouble than its worth with out experience. When it was doing the scan, did it restart and then you noticed the changes as the scan could be a red herring and a coincidence. I agree with Mark about potential infection and meant to add on the end of my post to run Malwarebytes, I think the following link takes you straight to free version https://downloads.malwarebytes.org/file/mbam_current/. Unless you really want to pay, make sure you don't agree to any "pro" or "trials" or similar terms that try to get you to upgrade. Some viruses try to fool or stop ant-virus scans/detections and can cause a battle. I'm also wondering if you have accidentally gone into tablet mode instead of laptop/desktop mode - this has a left/right setting for drop down menus and maybe more tricks like that. Hit the Windows and "A" key at same time to open action centre, at the bottom will be tablet mode button which toggles on or off (light colour when off (desktop/laptop), dark colour when on (tablet) - click outside the box to exit this menu. Tablet menu usually has the start menu icons on the screen instead of pop-up. I have done malwarebytes and nothing was found. Tried hitting the windows key and 'A' which didn't work (?) but did find the settings for laptop/desktop or tablet mode and my laptop is not in tablet mode. If I did a system restore and clicked to keep all my files/folders, then I would have to reinstall a long list of apps, which I am reluctant to do, in case anything else goes wrong. System Restore should offer you dates you can roll back too. It normally keeps all documents and library folders as is. It doesn't reinstall it just rolls back, you will need to select a date before the changes occured. Were trying to offer you easy home options that may work. Obviously backup any important pictures or documents first. This process is available if system restore has been enabled, if not there will be no roll back option. Just so were are chasing the same ghost. I appreciate everyone's help greatly and you explain things well that I can follow. That's why I asked on here regarding this problem. I have attached a screenshot, so I hope it works! Wow thats Mirrored, its not just the top x_ buttons. Ive been googling and checking settings and i cant recreate your issue. For now my advice would only be system restore. If that doesn't work there is one more thing to try before your going to basically do a factory reset. Let us know how you get on, DD may come back with another option but its got me stuck. As I said before, these are settings that can be bodged with "resource hacker" which creates a new shell32.dll, why Microsoft build the functionality in but don't allow you to change it is anyone's guess. I'm with Mark, you need to do a system restore - but I think with windows 10 you can't wind the system backwards unless you set up a system backup to a different drive. So you may be left with two options, a fresh install of Windows 10, or a Windows 10 reset. THIS page details the options and has links at the bottom which tells you how to do it. My previous post might be wrong on restore and backup. Looks like something changed on 8/2/2016. since then my computer is now doing automatic restore points as well as system backups.